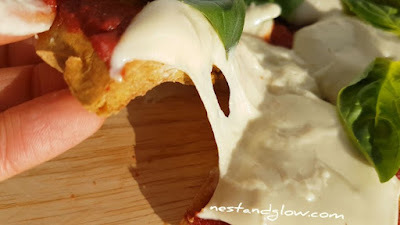 Quick and easy recipe for a quinoa crust pizza that is topped with melted cashew mozzarella. Suitable for gluten free, dairy free, vegan and general healthy diets. Full of heart healthy fats from the cashew dairy free cheese. If you need convincing to make this then watch the video recipe below to see the gooey vegan cashew mozzarella as you pick up a slice. It may look like a lot of ingredients and take an hour in total to make but each step is very easy. The oven is doing all work and only a small amount of prep is needed. The cashew mozzarella is especially easy to make, and the only way you can really go wrong is not stirring enough and the bottom burning. Soak the quinoa for 15 mins or overnight. Rinse and drain the quinoa then put in a blender jug with all the other ingredients and blend until smooth. Line a 8″ pan with greaseproof paper or just use a silicon pan and pour in the quinoa batter. Bake for 30-35 mins and 375 F / 190 C, until a knife comes out clean. Let stand for 5 mins and then take out of the pan. Bake for 10 mins on no tray at 375 F / 190 C, just to make it crispy on both sides. Empty the mozzarella mixture into a pan and sift in the tapioca starch. Heat gently while stiring constantly to stop the bottom from burning. It’s ready when its thick and gooey and rolls off the spoon slowly. Spread the tomato passatta over the base, then blob on the cashew mozzarella and sprinkle with basil leaves. 0 Response to "VEGAN CASHEW MOZZARELLA QUINOA CRUST PIZZA"